Appears during incubation period (1-6 months), 2-7 weeks prior to symptoms. Peaks when the patient is most ill.
Becomes undetectable in 3-6 months. Indicates infection – recent or chronic. Arises once the acute disease has resolved. Sometimes, not detectable unless until weeks or months after HBsAg has disappeared. This gap is called “window” period. Indicates, immunity (by vaccination or infection). 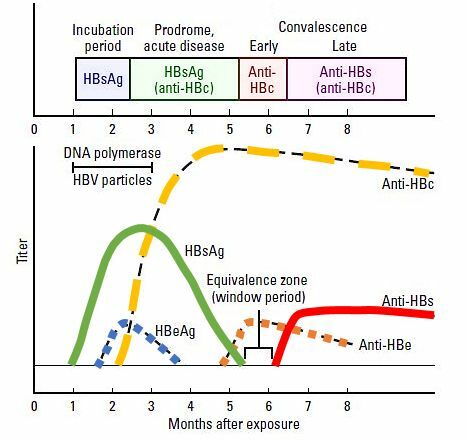 Anti-HBc IgM and elevated serum transaminases also appear shortly before the symptom onset. Over the next few months, anti-HBc IgM is replaced with an IgG component. 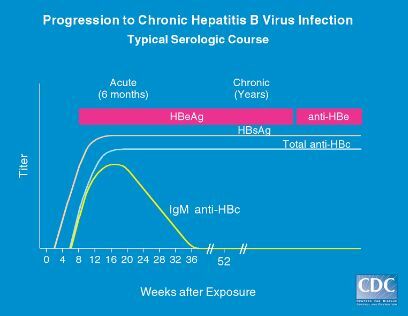 Shortly after HBsAg appears, HBeAg and HBV DNA can be detected in the serum and are markers of the acute viral replication. Anti-HBe appears shortly after HBeAg vanishes and indicates subsiding viral activity. I want to ask anti-hbs is 76.61.csbt/ is high or low. Many thanks. Previous Previous post: Is Nitrofurantoin effective for Skin infections?